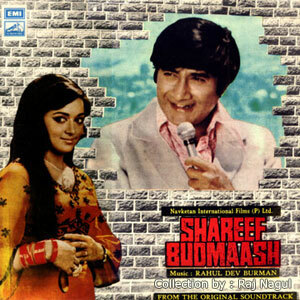 I wrote about ‘Shareef Badmaash’ today, then remembered that I had written about it before. It was almost exactly 3 years ago. I had pretty much the same things to say about the movie that I had back then. Two scientists spend 10 years designing a fighter plane like no other in the world. Their important research culminates in some school kid kind of drawings. Which they then copy on a microfilm, and destroy all the other papers. Obviously, we had not heard of archiving even back then. They carry the microfilm in a suitcase; promptly get killed by their driver, who then gets killed by his boss. In this film, people kill people rather than answering questions, or just for convenience. There is a lot of chasing, and spying, and following around, binoculars, and elaborate ruses to entrap people, which all seem completely unnecessary, as everyone, yes, every single person in the film seems to have recordings of every other person’s every single conversation. Bedrooms are tapped, police stations are tapped, and everyone is listening in to everyone else. In the end, the main villain (Ajit) is left with a tattered suitcase where the microfilm is hidden but which he can’t get to, and another suitcase full of money which he got for the said microfilm, and then killed the dealers. He looks a little sad and lonely, and I am wondering what he is going to do with all that money, since he has killed all the people who were on his side. But then, we have Dev Saab, and Hema Malini. She is young, gorgeous, and has lots of dresses which strip down to become something else. With Dev Saab, Hema always seems more relaxed, her coyness disappears. In 1973, Dev Saab was 50, and looks around 30, and Hema was 25, with that special sheen she had in her first few years. Hema is a cabaret dancer in the film, has a criminal past, and also has had her share of boyfriends, but thankfully, there are no big moments of regret or shame. Dev does tell her gently once that she need not be a cabaret dancer, but she shuts him up, and his final lecture to her is about duty to the motherland, and not about her being a good woman, or anything like that. And there is a fabulous scene between Hema and Helen, where both drunk, praise each other’s beauty, and finally, give each other a hug. The kisses are un-attempted, but the chemistry is evident, and so rare in Hindi films. Before that, they also do a strip dance together, and they really throw sparks off each other. This is all you need to watch the film for. Dev’s heroines were unabashedly human. Whatever else you could accuse him of, you couldn’t accuse him of double standards. I haven’t watched the film, but you make me want to. Yes, Anu, his heroines seem self-assured in many ways, just like him. I remember this. Catchy songs even! A finale in snow. Ava, yes, it has lovely songs.